A funny thing happened in 2014. Somewhere along the way, my inbox consistently stayed…empty. But since I’m all about “sharing is caring”, I’m going to share the 6 apps and the system that helped me achieve the elusive Inbox Zero. Afraid you may be missing an important piece of mail? Play The E-Mail Game, a Gmail plugin that turns your overflowing inbox into a speed drill to delete, archive, or respond to your hundreds of messages. I never respond within the game – instead, I leave the messages in my inbox so I can respond to them without the time crunch. Once it’s clean, keep it that way with Unroll.Me. It is hands-down, the best tool to unsubscribe, keep the same, or roll up all those newsletters and sales alerts into one concise daily e-mail. If you’re not signed up yet, sign up now. And relish in the glory of a cleaner inbox. I check my e-mail four times a day. That’s it. I don’t have the self-control to keep Gmail or Outlook open all day, given that I’d spend my entire day responding to e-mails. I give myself a single Pomodoro (25 minutes) each time to respond, delete, or save every e-mail. E-mails that require a more lengthy response get created into a Todoist task, and every message gets responded to in my evening e-mail response block. I save a ton of time on responding to e-mails with the help of canned responses. Meg wrote the best tutorial on setting it up, and I use my canned responses for sending the En Route With questionnaire, responding to sponsorship inquiries, and introductory e-mails. Lots of time is wasted searching for how you know the senders from e-mails. Thankfully, there’s a tool for that. To cure those “how do I know you?” Facebook/LinkedIn/Google stalking, install Rapporative in your Gmail IMMEDIATELY. It syncs to your social networks, brings up prior e-mail exchanges, and has a text field for you to enter your own notes. It also pulls up a picture of your sender from one of their social networks, putting that oh-so-helpful face to the note. I’m supremely guilty of both not following up OR sending e-mails at crazy times, thanks to my travels. Boomerang has been my savior for both issues – I can schedule a future date for my message to be “boomerang’ed” back to me, to ensure I’ve followed up. I can also schedule e-mails to be spent at a business-appropriate time when I’m on the go or cranking out e-mails in an insomnia stupor. Both of these tools have helped me immensely in intelligent e-mailing – both in knowing my sender and sending it at the right time. That’s it! 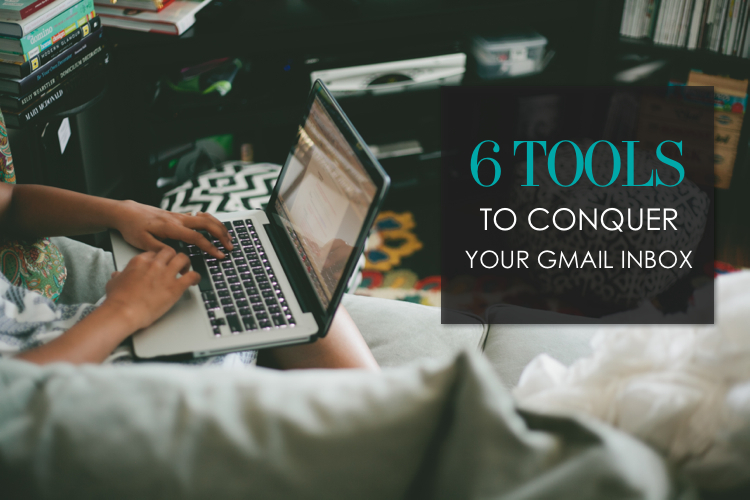 My 6 top tools AND my system for managing my multiple Gmail accounts…and not go crazy. I’d love to know – how do you manage your e-mail and keep it under control? Any different tools or tips you’d recommend? COMMENT below and let me know!